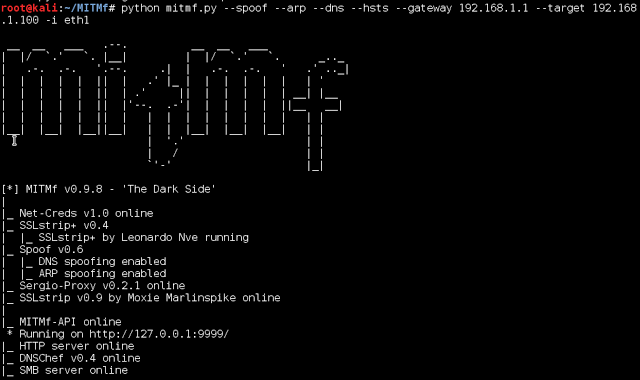 hping is a command-line oriented TCP/IP packet assembler/analyser. The interface is inspired to the ping unix command, but hping isn’t only able to send ICMP echo requests. It supports TCP, UDP, ICMP and RAW-IP protocols, has a traceroute mode, the ability to send files between a covered channel, and many other features. While hping was mainly used as a security tool in the past, it can be used in many ways by people that don’t care about security to test networks and hosts. It is a network tool able to send custom TCP/IP packets and to display target replies like ping do with ICMP replies. hping3 can handle fragmentation, and almost arbitrary packet size and content, using the command line interface. Since version 3, hping implements scripting capabilities, read the API.txt file under the /docs directory to learn more about it. Basically hping uses the Tcl language as scripting language to write networking and security related applications, test suites, and software prototypes. To run hping in scripting mode just run it without arguments. hping works on the following unix-like systems: Linux, FreeBSD, NetBSD, OpenBSD, Solaris, MacOs X, Windows. So this is a big one, and thankfully this PayPal Remote Code Execution Vulnerability was discovered by security researchers and not the bad guys. Although there’s no way for us to know if someone has been using this to siphon data out of PayPal for some time before the whitehats found it. It’s a roundabout bug that turns out serious, and why I tell developers don’t mess with serialised data – it’s ugly. In this case object deserialisation in Java basically allowed for remote command execution on PayPal servers. Independent security researcher Michael Stepankin has reported a since-patched remote code execution hole in Paypal that could have allowed attackers to hijack production systems. The critical vulnerability affecting manager.paypal.com revealed overnight was reported 13 December and patched soon after disclosure. It allowed Stepankin to execute arbitrary shell commands on PayPal web servers through Java object deserialisation opening access to production databases. “While security testing of manager.paypal.com, my attention was attracted by unusual post form parameter “oldFormData” that looks like a complex object after base64 decoding. It was reported responsibly and fixed fairly quickly, PayPal does have quite a good record of reacting in a timely fashion. Attackers would need to follow the technique disclosed by FoxGlove Security to gain remote code execution. Stepankin says he used their ‘ysoserial’ payload generation tool in his attack. PayPal handed out US$5000 for the bug even though it was a duplicate of a report sent in two days prior by researcher Mark Litchfield. Most bug bounty operators do not pay for duplicates making the payment unusual. Strangely enough it seems to like two researchers found the same bug within days of each other independently. So PayPal paid them both a bounty, which is very rare – and pretty cool IMHO. Pretty good earnings for a months work, although I might imagine he’s had a fair number of those bugs in pocket for a while. RWMC is a Windows PowerShell script written as a proof of concept to Retrieve Windows Credentials using only PowerShell and CDB command-line options (Windows Debuggers). 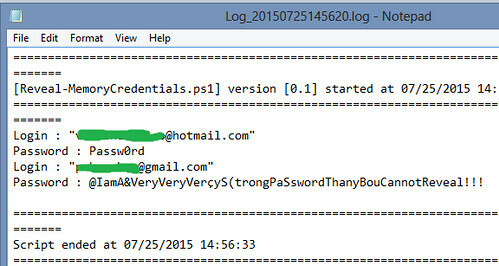 The script is different from Mimikatz or WCE because it doesn’t work with system .dlls to decrypt data. All the decryptions are made in the script. So sadly, but also unsurprisingly ‘123456’ is still the most common password for 2015 (based on leaked password lists) the same as it was in years before, e.g. 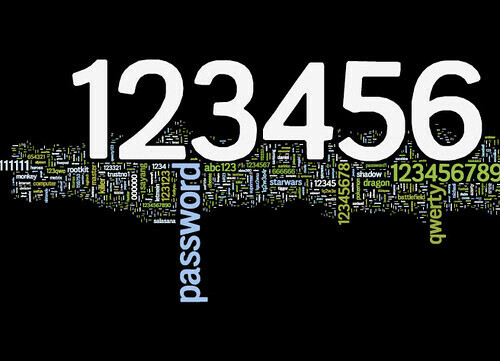 The 25 Worst Passwords Of 2013 – “password” Is Not #1. Way back in 2006, it clocked in at number 5 in a rather UK centric look at passwords. Interestingly, back in 2006 a weaker version of the same password was number 1, I think 6 digit password requirements hadn’t become commonplace yet. SplashData has announced the 2015 edition of its annual “Worst Passwords List” highlighting the insecure password habits of Internet users. “123456” and “password” once again reign supreme as the most commonly used passwords, as they have since SplashData’s first list in 2011, demonstrating how people’s choices for passwords remain consistently risky. In SplashData’s fifth annual report, compiled from more than 2 million leaked passwords during the year, some new and longer passwords made their debut – perhaps showing an effort by both websites and web users to be more secure. However, the longer passwords are so simple as to make their extra length virtually worthless as a security measure. And as you can see this year, 8 characters minimums must have become a thing with 12345678 clocking in at 6th place. You’d think with all the massive, extremely messy, public hacks that have taken place – people would have wised up a little. But then I always forgot the number of stupid people is a constant, so the more people come on-line or use computers, the greater the absolute number of idiots there are. The only thing I’m glad about is that football is more popular than baseball. As for preventing this, use a password generator (preferably the one inside your password manager, because you are using a password manager right? ), use separate passwords per site (easier with a password manager), don’t use predictable passwords (yourname, yourname1 etc for each different site). 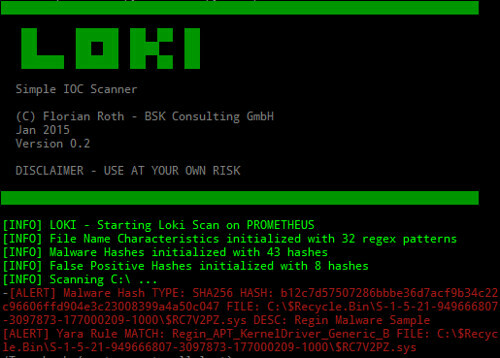 Loki is a Indicators Of Compromise Scanner, based on 4 main methods (additional checks are available) and will present a report showing GREEN, YELLOW or RED result lines. The compiled scanner may be detected by antivirus engines. This is caused by the fact that the scanner is a compiled python script that implement some file system and process scanning features that are also used in compiled malware code. If you don’t trust the compiled executable, please compile it yourself. The Windows binary is compiled with PyInstaller 2.1 and should run as x86 application on both x86 and x64 based systems.